It is fun to have time out of the office, but good to be back. 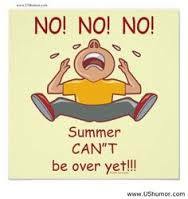 Today marks the “unofficial” end of summer for my crew, as Monday is a school day. Back to the normal schedule, no more staying up late and sleeping in… All good to be back on schedule SOOON! Wall Streeters do not return until after Labor day, for the most part, so volatile markets and Doogie Howser’s control may still be the theme for the next couple. Ah, but that is all next week… enjoy your Friday, headed into the weekend ! This entry was posted in John Kvale, Personal and tagged Doogey Howser, Doogie Howser, Labor Day, last day of summer, school day. Bookmark the permalink.